What Makes An Amazing Yoga Holiday? 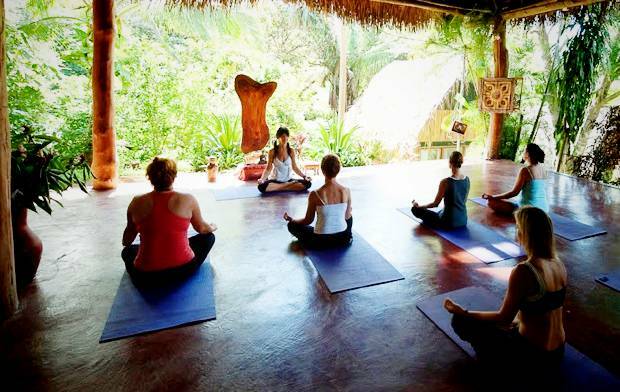 A yoga holiday can help you tone up and energise the body, release pent up stress and anxiety and reconnect with yourself in a short space of time. So what should you look for when choosing a yoga holiday to make sure it’s money well spent? Yoga holidays are supposed to be just that - easy going, relaxing, and a proper break away. The best are held in rejuvenating locations with soothing views, fresh air and plenty of peace. Beds should be comfortably large and firm, and you should be able to have your own room if need be - for which you will usually pay extra. Access to local walks that don’t require a car, and proximity to water such as a swimming pool, a river or the sea, are always attractive options. The best yoga holiday must offer decent, effective twice-daily yoga classes, usually with a more energising, yang class in the morning and a more nurturing, yin session in the evening. Time is usually set aside for pranayama and meditation as well as asanas. There should be plenty of space and opportunity during the day for creating, walking, thinking, journalling, sight seeing if you’re so inclined or just hanging out. Access to good massage and holistic treatments is vital, or even life coaching, to help ease your muscles and sort out your mind. These often cost extra, but can really add to your break if the therapists are good - ask in advance. The quality of food on offer is vital. You should be served always delicious and mostly organic and natural foods grown on the land. Sometimes fish is an option, but not meat, and in some cases, no dairy products. Eating a cleansing, healthy diet will support your yoga and its natural detoxing effect, and a vegetarian diet promotes Ahimsa, the sanctity of all living creatures, an important part of yogic philosophy. The teaching will make or break your yoga holiday, so choose with care. You want to find an inspiring, experienced and ego-free teacher whose chosen method and teaching style suits your own character and taste. Most yoga holidays are aimed at all levels, so the teacher should be skilled at handling a mix of abilities, ensuring everyone feels nurtured and challenged but never bored or over-stretched. The best teachers have usually been influenced by a range of styles, and will bring their own secret ingredient to their yoga classes, as well as sound knowledge of anatomy to help prevent injuries. Feel at liberty to ask a yoga teacher about their training before you book a yoga holiday, though bear in mind that learning to be a yoga teacher isn’t like training to be a fitness instructor – as well as having qualifications, teachers will draw on their life experience and depth of their own practice. If you’re new to yoga, try a few classes with different teachers before choosing a holiday, and feel free to experiment with different styles as you progress. Check out my website, The Queen of Retreats, for more tips and inspiration.